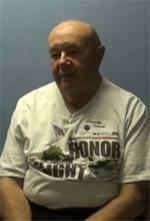 6/1944 Donald Conrad enlisted when he was 17 when he had a couple months left in high school. 8/1944 Did basic in Great Lakes then did basic engineering school for 6 weeks then went to California then to Washington to board the Franklin. 2/2/1945 On the USS Franklin his job was to keep the aircraft carrier moving. He maintained fire boilers, pumps and turbines. The Franklin served in the Pacific theater. 3/1945 CV-13 with Task Group 58.2 struck the Japanese homeland in support of the Okinawa landings. Later she joined Task Force 58 units to launch attacks on Kagoshima and Izumi. 3/19/1945 Franklin was hit by an armoring piercing bomb with all planes gassed and on deck 40 miles off the coast of Japan. Most of the damage was caused by its own ammunitions exploding. Franklin lost 938 men in total but over 800 during one attack. Franklin was towed for two days before it could get underway to Brooklyn Navy Yard where Donald remained until the end of the war. 4/28/1945 Towed by the cruiser Pittsburgh for two days and then proceeded to Ulithi Atoll under her own power. Then went to Pearl Harbor until she was repaired enough to make it all the way through the Panama Canal to Brooklyn Navy Yard.